"The Strange Case of Dr. Jekyll and Mr. Hyde" was published in 1886 by Scottish author Robert Louis Stevenson. This Gothic horror novella has permeated the imaginations of readers to this day. Although modern readers may simply write off the aforementioned Doctor Jekyll as having dissociative identity disorder, those who delve into this novella can also find a different thesis: that being evil is fun. "There was something strange in my sensations, something indescribably sweet. I felt younger, lighter, happier in body; within I was conscious of a heady recklessness, a current of disordered sensual images running like a millrace in my fancy, a solution of the bonds of obligation, an unknown but innocent freedom of the soul. I knew myself, at the first breath of this new life, to be more wicked, tenfold more wicked, sold a slave to my original evil and the thought, in that moment, braced and delighted me like wine." Compared to Jekyll, Hyde is younger (ostensibly because the "evil" side of Hyde is less developed). With no need to conform when being Hyde, Jekyll experiences a freedom that is admittedly pleasurable and intoxicating. Jekyll knows that he has the capacity to create havoc and destruction as the sociopath Hyde. Regardless of this fact, Jekyll keeps on reaching for the serum that allows him to become Hyde. The same can be said for many in our own modern society. Our own personal, individual, modern day Mr. Hyde's may be an addiction, or being a troll on the internet hiding behind a cloak of anonymity. A more benign Mr. Hyde may be a consensual sexual relationship that satiates a non-mainstream appetite, taking the last cookie from the cookie jar without replacing the batch, or allowing the delicious feeling of schadenfreude to wash over you when you see a nemesis fail. Regardless, arguably, the majority of humanity has had a taste of evil or non-conformity to societal norms, and has enjoyed it. "To cast in my lot with Jekyll, was to die to those appetites which I had long secretly indulged and had of late begun to pamper. To cast in it with Hyde was to die a thousand interests and aspirations, and to become, at a blow and forever, despised and friendless." 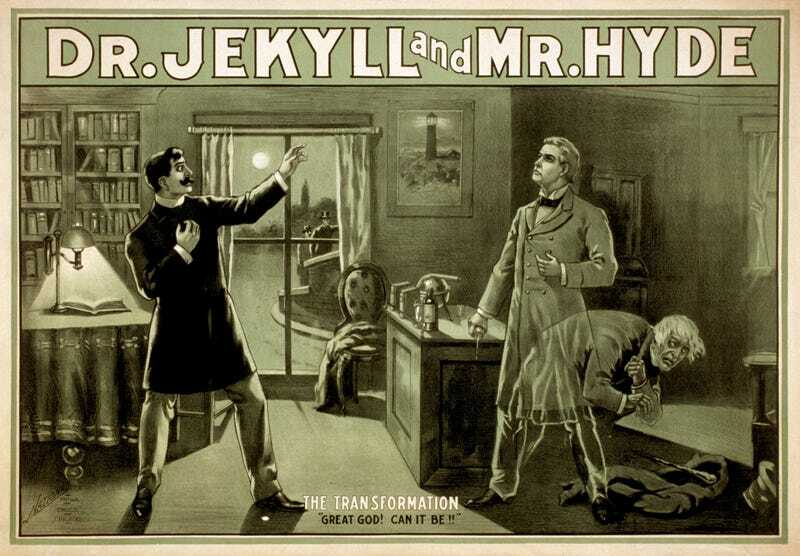 In lieu of dealing with absolute actualities of human nature, I recommend that instead we all embrace more cordial apparitions of Mr. Hyde, and more adventurous incarnations of Dr. Jekyll within ourselves. Being completely evil may be fun, but unconditional evil always comes at a cost. Stevenson, Robert Louis. The Strange Case of Dr. Jekyll and Mr. Hyde. Boston: Houghton Mifflin Harcourt, 2013.